*The letter “P” in the title “Paradise” is reverted.? 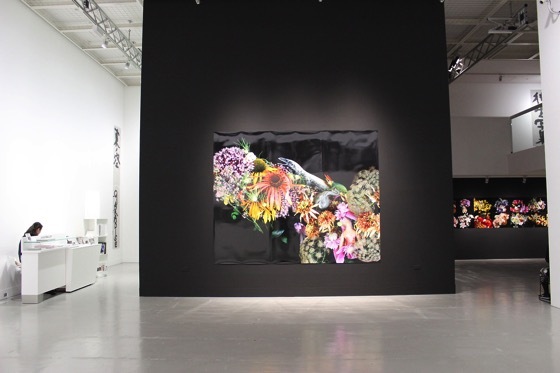 When entering the space one comes across is not a photograph but Nobuyoshi Araki’s 3 calligraphy pieces saying: “Higashi no Sora” (Eastern Sky), “Paradise”, and the other “Ojo Shashu” (Photography for afterlife). Ojo is a buddhist word for death as the end of a journey after fully living one’s life. Araki created the word “O?jo? Shashu?” based on the title of an influential Heian-era religious text, “O?jo? Yo?shu?” (Teachings Essential for Salvation, written in 985 by a Buddhist monk Genshin). 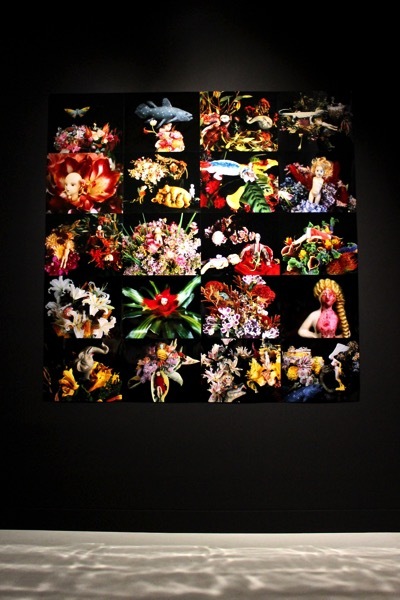 In Araki’s personal life, there were several events that strongly remind him of mortality. He diagnosed prostate cancer in 2009, lost his loved cat after living together for more than a decade before and after his wife’s death and lost the sight of his right eye. He incorporated all his personal stories into his work. At the top of Shiseido Gallery’s tall walls a row of 13 photographs are displayed. These are a part of the series “Eastern Sky 2014″. These images were taken from the top of the photographer’s house. 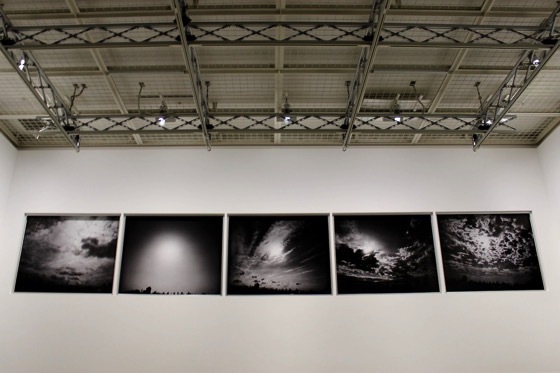 Since March 2011, after the earthquake that devastated the Tohoku (north east) area, Araki wakes up every morning at 7 am to shoot the same Eastern Sky. The East here has a double connotation, the rising sun (symbol of Japan as a nation) and the north east of Japan. Araki uses this series as a ritual of hope and faith, and intends to continue to do so until this area is rebuilt. 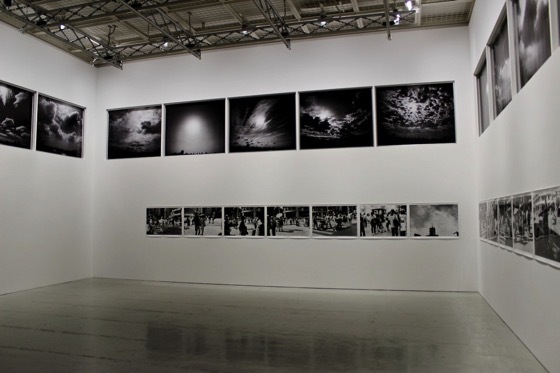 The photographs are displayed as if you are seeing the sky from a window. The original walls of the gallery were covered with plaster to create square frames around the photographs that resemble windows facing the East. 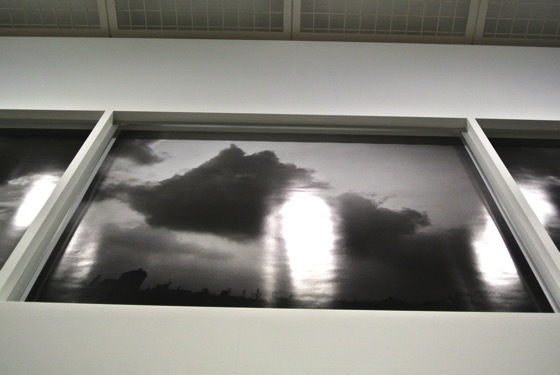 Nobuyoshi Araki “Eastern Sky 2014″ seen from the bottom. It is set in a window like frame. 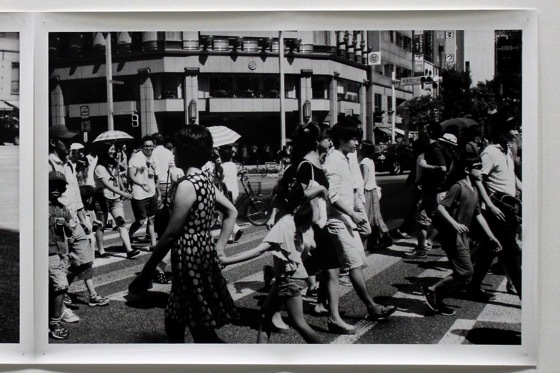 Below the “Eastern Sky 2014″ is another series of 13 photographs “Ginza 2014″ that Araki took during this summer in Ginza. He contextualized this exhibition with surroundings of the gallery’s location. 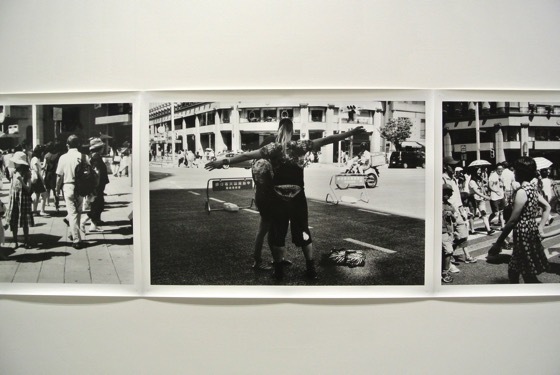 With these images, the artist pinpoints the contrasts between the current state of the To?hoku area and one of the most prominent districts of the country’s capital. 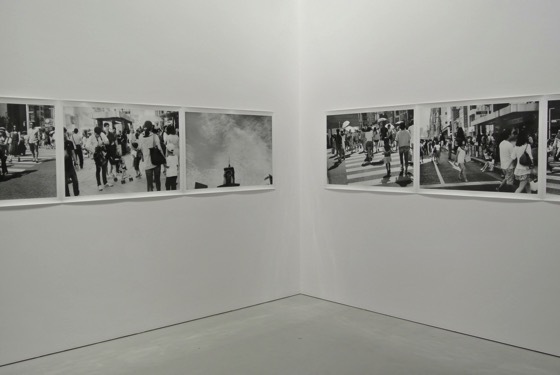 Both series are in black and white, which gives a sense of intemporality as if “when” photos were taken is not a matter here. What’s important is the place where the events are taking place. 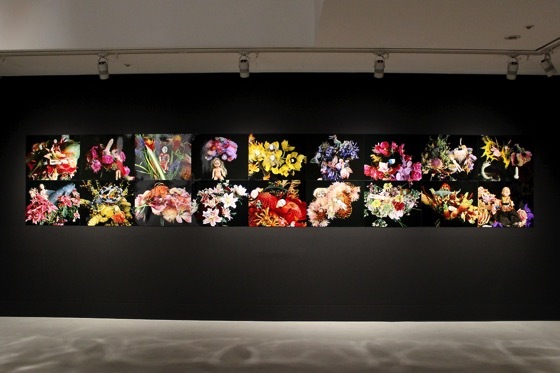 The exhibition continues with “Paradise 2014″, which consists of 55 photographs that from afar seem to depict colourful flower arrangements in a strong black background, but on a second glance the viewer starts noticing the details. First, these flowers are dying, secondly they are alongside old dolls and toys. 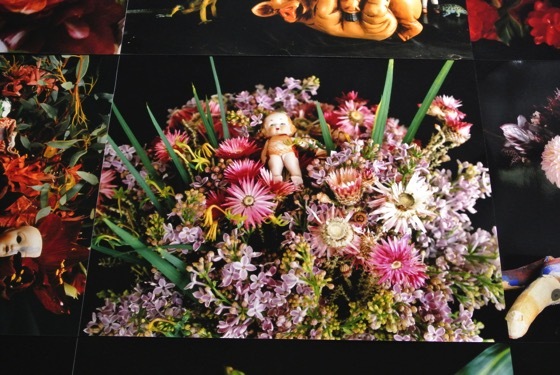 Araki staged these photographs at his own house with his weekly delivered flowers. He picked the ones about to die as he finds them more appealing. And the dolls were brought by the artist, some from antique toy shops. His paradise is not a usual sunny and happy paradise. He expresses it with humor and sarcastic intensity. So the letter “P” of title “Paradise” is inverted. This might be his ideal heaven. This show is in a deeply philosophical tone with his thoughts on the afterlife. Even in both personal and global turmoils, Araki never turns down but surrenders them to integrate anything into his expression. Each person must have their own idea of afterlife and here he showed his own.